Exxon's Q1 earnings projected to decline year over year. Trading losses may drag on performance. Recent refinery fire may drag further. Puts ramping up shale oil into perspective. Exxon's 21% EPS decline is the second-worst among its peer group. The worst is Chevron (CVX), projected at a 25%. Coming in better are Shell's (RDS.A) 18% and BP's (BP) 10% decline. These declines stem from a range of factors, predominantly the lower price of oil in Q1 2019 vs Q1 2018. Two items disclosed in the past month may weigh on Exxon's earnings more than anticipated in consensus estimates, both in Q1 and future quarters. These are a recent refinery fire at Baytown near Houston and trading losses from Exxon's recently expanded trading group. The fire was ahead of a potential $1.9 billion expansion at Baytown. It is unclear how much the repairs may cost and if Exxon will be responsible for penalties or further clean air modifications, but the costs could be significant, as could the lost revenue from downtime. A settlement with the DOJ in 2017 required more than $300 million of modifications and a $2.5 million penalty. The trading losses are particularly interesting. Reuters broke a story on this from my tip (frustrating to be the source and not to be quoted). Incidentally Reuters missed the point - in the presentation by Exxon's head of downstream, the executive mentioned that in a rising oil price environment, investors should expect losses at the high end of the range displayed (up to $250 million). The story wasn't just that Exxon had ramped up trading activities, but that the ramped up activities were resulting in hundreds of millions of dollars of unexpected losses. Both the downtime and repairs at Baytown as well as trading losses from rising oil prices may weigh on Exxon beyond the first quarter. Consensus earnings for Q2 may need to fall as well, which could weigh on the stock. This ties into Exxon and Chevron's ramp up in the Permian. One explanation for Exxon's acceleration of activity that I hadn't considered was that things might actually be going worse for Exxon elsewhere. Despite confirmed lower well productivity (subsequently confirmed in conversations with multiple service providers to Permian upstream operators) and despite suppressed earnings from shale oil drilling activity (a source of Chevron's EPS decline in Q1), perhaps accelerating activity in the Permian is return maximizing. 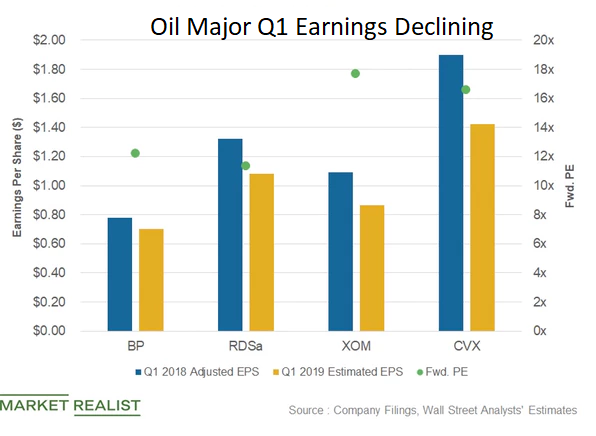 Perhaps it is an indication of problems elsewhere in Exxon's portfolio (such as refinery fires and trading losses) that Exxon is redirecting capital and finding maximum risk adjusted returns in bottom-quartile Permian development.